Most of our folders are flooded with duplicate or similar images resulting in loss of storage space. 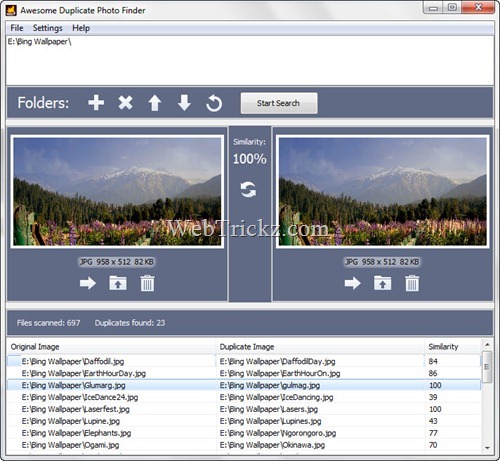 I’ve searched a small and useful tool, which allows users to easily Sort duplicate Image files from a folder, let them Find and Remove Duplicate Pictures and Photos. The program is able to compare pictures that was resized or pictures with corrected colors (black and white photos etc.). It supports all major image types: JPG, BMP, GIF, PNG. To use it, just ‘drag and drop’ folders to it and click ‘Start Search’ button. Look for most similar images, move or delete them.